Welcome to the equipment and supplies experts for print shops – Southwest Binding & Laminating! For heavy duty punch, bind and laminating equipment, you've come to the one place that can provide you exceptional resources, knowledgeable sales support with true industry experts, and rapid order fulfillment and same day shipping. 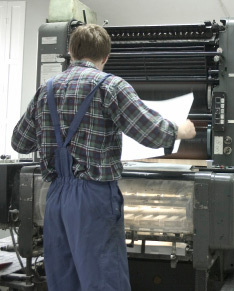 We also offer card slitters, booklet makers and folders, with telephone installation support, and supplies matched perfectly for your output needs. A print shop helped a local farming client use Permanent Paper for a live stock tag that would hold up in the field and be durable, so they could log the animal during its existence. Pressure Sensitive Permanent Paper was used for an Army veteran wounded in war. He wanted a window cling to hand out to people on the street that would direct people to a website that accepted donations for fallen soldiers during war.